Copper high quality statue with 'cold' gold painted face. Decorated with turqoise and coral coloured stones. 8 inches high. 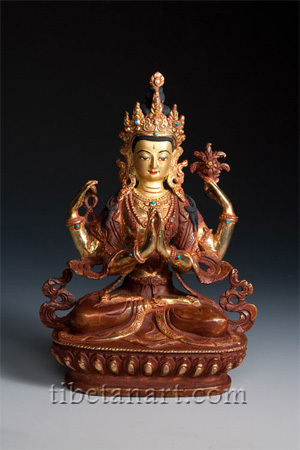 The Buddha of compassion, Chenrezig or Avalokiteshvara is the patron deity of Tibet. His first two arms hold a wish-fulfilling jewel, his second two a white lotus and a rosary.